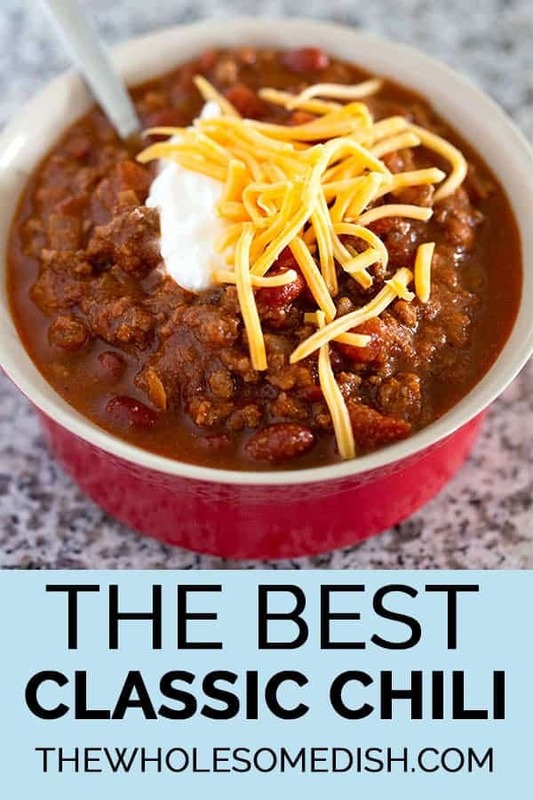 The Best Classic Chili – This traditional chili recipe is just like mom used to make with ground beef, beans, and a simple homemade blend of chili seasonings. Watch the step by step recipe video for this chili recipe below. 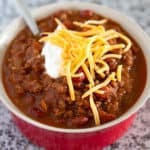 The Best Classic Chili - This traditional chili recipe is just like mom used to make with ground beef, beans, and a simple homemade blend of chili seasonings. I typically skip the cayenne pepper because I have a young kiddo. Then, I put out some hot sauce for those adults that want to add some spiciness to their chili. I’ve never made chili before so I did exactly what the recipe said. I was very excited to try this recipe because of the high praise. I was extremely disappointed. Waaaay too sweet! I flat out hated it. Waisted my money on all the ingredients. Two Tablespoons of sugar, really? All you had to do was omit the sugar. Easy peasy. This recipe is delicious, I left the sugar out as I have diabetes in my family. My family and friends love it!!! Perfect for the Superbowl party!! I’ve also doubled it for a potluck dinner ! I’m not so sure you did exactly what the recipe says. Granted if you did. Be aware of how much sugar or salt to add to your recipes. Its all up to personal taste. 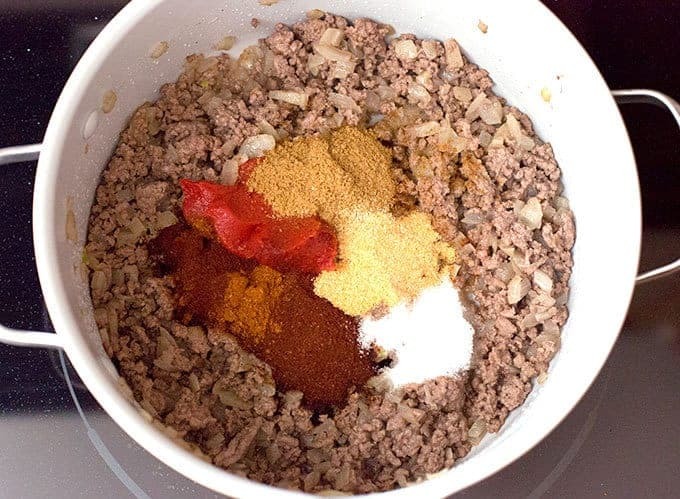 This is my favorite chili recipe on the net. You must have made it incorrect. The point is not to taste the sugar. No one even knew I used it when I made it. Best chili ever! Whole family LOVES this meal! If you don’t like sweetness with your chili, cut the sugar to 1 tblspn or none at all. This is good chilli. I substituted for grass feed beef, 1 can of Dei Frateelli 28 oz can of sauce, only. I used organic chicken broth , instead of beef broth, and lowed the salt. I also used 15 oz dried red beans, and prepared according to the directions. I’ve made this chilli about 4 times. Making it again tonight. Love it! Will never use the bag chili again. This is the best Chili ever, made it 3 times, having it tonight. THANK YOU for sharing this recipe. Great ratios of spices. My husband doesn’t like garlic, so I substitute onion powder in the same amount with great results. I tried the suggestion in the comments to use a full can of tomato paste (6 oz) and a large (28 oz) can of the diced tomatoes instead of tomato sauce. Worked very well. This, like all the best chili recipes, add extra cumin. The amount in the chili powder isn’t enough. This is a great recipe, I can see from the other comments that it’s easy for people to do tweaks, so it’s making a lot of people happy. I grew up on thinner chili so I used a 15 ounce can of tomato sauce and a extra can of diced tomatoes. 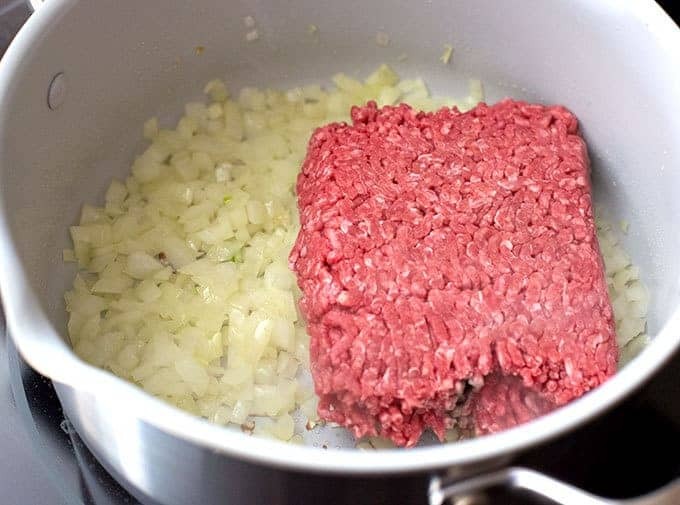 Also used leaner ground beef than called for (health reasons) and less garlic (I love it and would double it, lol, but hubby hates it. I never thought to use beef broth but always will now. Thank you! Thought it was amazing! Only did 1tbsp sugar and it was great! I added white kidney beans as well and a can of drained corn. Super yummy! Great recipe!! yes used corn and broken spaghetti, best yet. Yes just put twice the amount of each ingredient in. Do not try to triple it because it will be three times the size. Delicious… made it exactly as suggested but without the added cayenne. Really lovely. Spicy, tasty and dead easy. I used half the sugar but made the recipe as is otherwise!!!!! totally delicious! Online, I’ve found a few recipes for beef and turkey chilis, with or without beans, with or without cinnamon, etc. So many varieties, i could never really rely on one particular recipe. 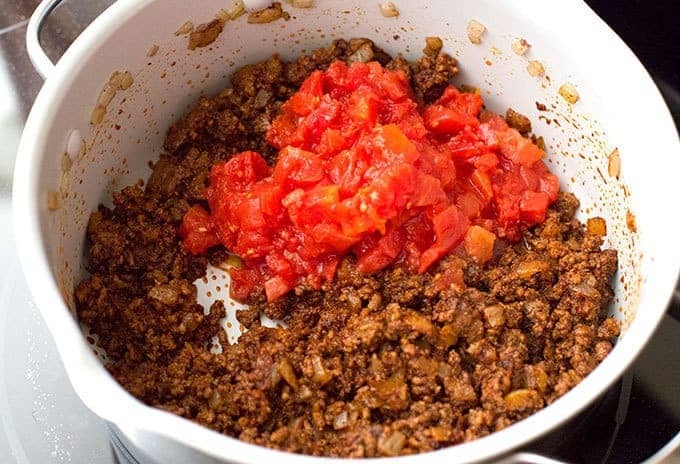 Wanted to make chili tonight for dinner and this recipe was the first to pop on google. I usually don’t choose a recipe based on its rank/listing, but I clicked anyway. Scanned the recipe and thought it was simple enough and familiar enough among other chili recipes. I like this recipe. A lot. I followed the recipe, exactly. No substitutions. No alterations. 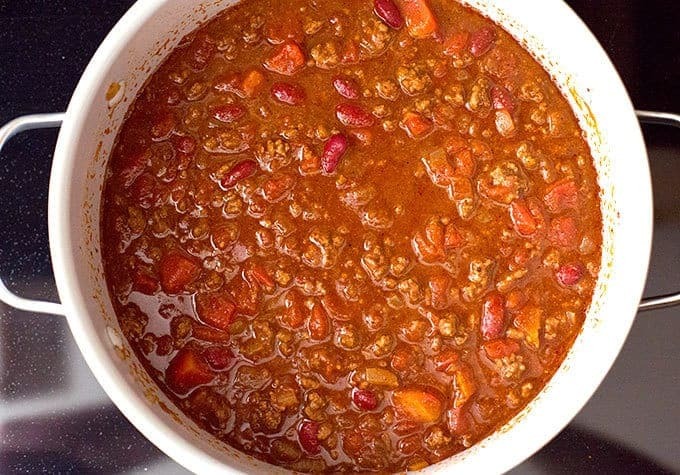 This was the most headache-free recipe for chili ever! I won’t attest that it took me 30 minutes. But I was done under an hour. I ate the chili three hours later and it was delightful. Thanks for a go-to chili recipe! Maybe I will add some other things in the future, but this works in a flash! Absolutely delicious! I always keep coming abvk to this chili recipe cause it’s simply one of the tastiest to make in such a short amount of time. I made some alterations like using low sodium diced tomatos, paste, and sauce, as well as using low sodium chicken broth instead of beef broth. I also added way more spices, some chopped anaheim peppers and a lot of snipped chives. I omitted the sugar as it wasn’t needed upon tasting. I love that you can take this recipe and expand upon it! Thank you so much. for such a simple chili it was really great ! thank you …I used a little less sugar, 5 fresh tomatoes and espelette pepper instead of cayenne … Wow , simple and so fast for a chili ! Probably one of the best pots of chili I’ve ever made! You know you’ve found the perfect recipe when you’ve made this chili! I’m giving it 5 for ease. I’m sure there are better chili recipes but this is pretty good and super easy and quick to make. I omitted one of the tablespoons of sugar to cut sweetness and didn’t have tomato paste available so I simply added a little spaghetti sauce from a jar. Turned out pretty tasty. This recipe is the best I’ve ever made or had. Instead of sugar I let it simmer with a cinnamon stick and use fresh chopped chilli instead of powder. Comes out great. Absolutely awesome chilli!! I’ve used this recipe multiple times & every time it’s been delicious!!! I’ve made this as is about six times and it’s great! However, I got in the mood for an Italian version and it turned out great too. I substituted 2 teaspoons oregano for the chili powder (teaspoons, NOT TABLESPOONS – I found that out the hard way) and 2 tspns basil for the cumin. Cannellini/White Kidney beans for the red kidney beans and a pound of sweet italian sausage instead of ground beef. Turned out great except that the seasoning in the sausage was too strong so I will do half a pound of Italian sausage and 1/2 pound ground beef next time. Oh I also sauteed 2 tspns minced garlic and threw in a 13 oz bag of tortellinis. The tortellinis were great but absorbed a lot of the moisture. I may hold off on them next time. I am going to try adding some ricotta cheese and Parmesan cheese next time. Otherwise I followed the rest of the recipe as is. Thank you for sharing this recipe. My husband really liked it and I will be making it again in the future. I only make this chilli recipe. The greatest. When I bring some to my office, everyone goes nuts. Love it! I don’t eat chili but I work for MLB so during baseball season I make a week’s worth of meals for my family on a day off. This was quick and easy and I doubled the recipe so I could freeze some. I got rave reviews from everyone. Really excellent recipe. From my cooking experience (novice) I swapped the regular sugar for brown sugar. makes a small difference.